If you need something done, getting a busy person to do it. Oh how true this statement is! When I was working full time, I was able to write more frequently on this blog, I was attending an event usually once or twice a week, doing some other sort of freelance work outside my full time job, exercising, catching up with friends as well as spending every second weekend at my partners house in the country. And now that I’m not working and am travelling around Australia in a VW, do you think I have had time to write on this blog? In all honestly, it’s been great to get away from the computer but even when I do want to write, it coincides with the fact that I have absolutely no phone/internet reception. But why stress? To think of the positive side, I have had plenty of time to read and therefore I am proud to review a couple of books for my loyal readers and lovers of Kiribati and the Pacific islands. Literature that centers around Kiribati – to me – is a diamond in the rough and I have had the pleasure to read two very different novels set in this beloved country. 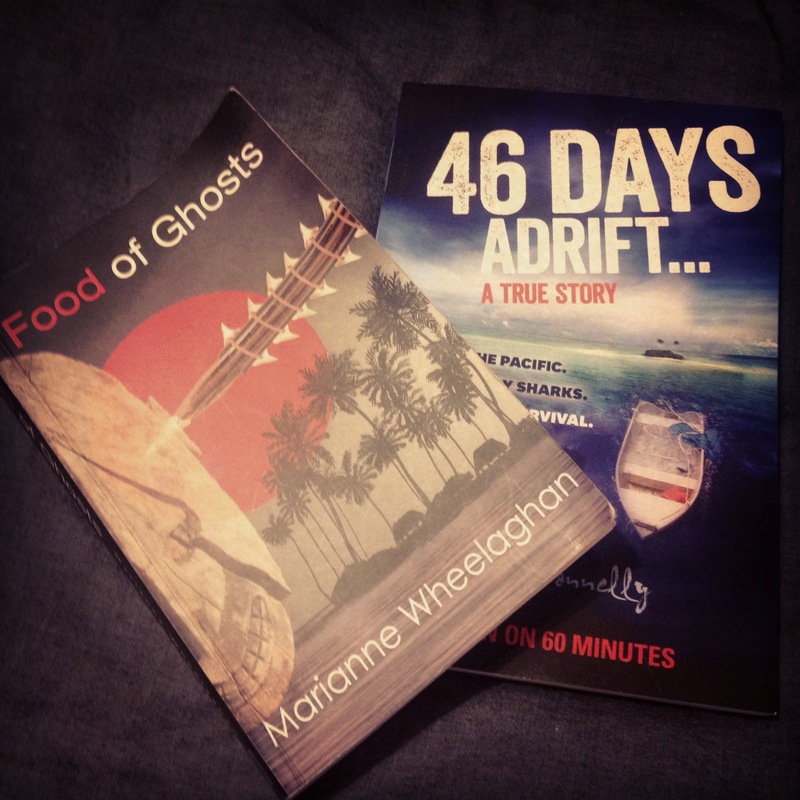 Food of Ghosts – Marianne Wheelaghan. A fictional crime novel set on Kiribati’ main island, Tarawa? I could’ve swam to the islands and back with all my excitement. Whilst I can’t say for sure, but I’m going to put it out there that such a novel has ever been written – if there has, well I certainly haven’t been told about it. Anyone who reads a novel that is set in a place that one finds familiar, will know the feeling of reading of descriptions of towns, people and cultures. It’s heartwarming, exciting and the best thing that I found – especially with this novel – is that it gives you an entirely new perspective on everything that you may have taken for granted. Opening with a bus ride from the main town of Betio to the Ambo lodge about 15 kms down the road, Kiribati life is so easily recognizable to a local reader and so exotic to those who have never heard of the tiny island; ‘Wild and furious on the ocean side and calm and placid on the protected, inner lagoon side, the Pacific surrounded the elongated ‘L’ shaped, narrow strip of land that was Tarawa’. From this small description we instantly realize that whilst the surrounding sea indicate a sense of space and open horizons, the strip of land holds a country full of gossip, curious onlookers and interconnected families that will provide more of a hinderance than a help to Louisa, our detective protagonist. Typical of Kiribati storytelling, one story leads onto another and a maze of rumours, a series of ‘he said, she said’ and family politics give in what is actually the ‘truth’ of the mystery. To begin with, the story seems to center around mainly expatriates and their frustration for living on the island is relatable – to any reader. I assume that Scottish author Wheelaghan’s description is based on her own experience from living in Kiribati for five years and I welcomed the accurate description of island life. 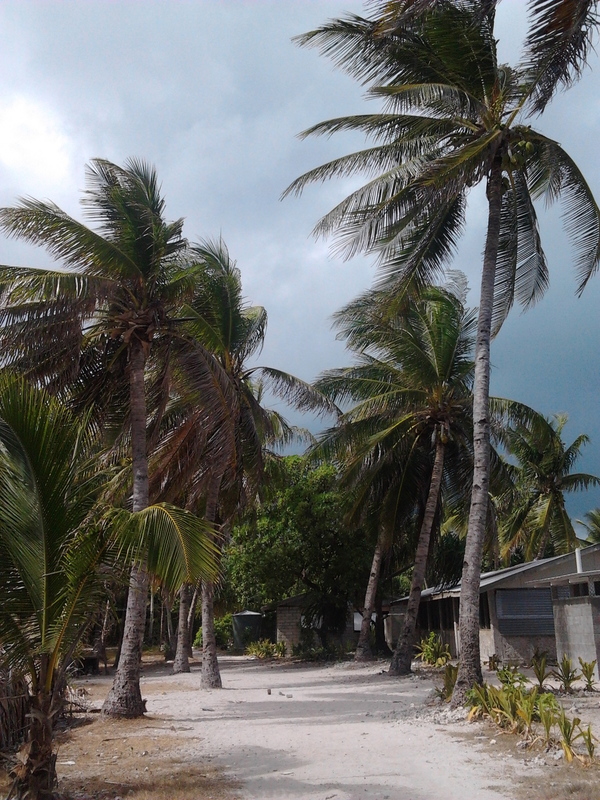 While Kiribati certainly looks like paradise to an onlooker, life on the island is slow, without much electricity and incredibly hot and humid. What seems to be a simple case of international workers seemingly having a pub brawl turns into a murder case filled with island folklore and locals watching every one of Louisa’s investigative steps. It is only a matter of time that Louisa is taken on many a path by locals wanting her to become involved in their own affairs and the reader feels Louisa’s confusion with her. Many locals offer their help with the case but frustratingly take her on long-winded explanations and stories that seem to have no end nor have any relation to the case she’s keen to get to the bottom of. Louisa isn’t keen to admit that she is in fact half I-Kiribati and in many ways she is a stranger to the country. There are many traditions and customs that she questions or is completely ignorant to which as a half I-Kiribati person myself, I am appalled that she hasn’t learnt even the simplest customs of her people. Reassuringly, Louisa’s local relatives mirror this response of mine. Her cousin – who has set up camp to live with her – looks over her with almost too close an eye and shows her disapproval when Louisa refuses to attend a family funeral and pay respects to other family members. It is through Louisa’s confusion of customs that allows readers to experience the culture shock and Wheelaghan balances the confusion of both sides with a realistic and easy read appeal. Without going into too much detail, the mystery gradually speeds up leading the reader to keep guessing which character actually has valuable and dependable information. Louisa is a complex character who if anything, is as much of a mystery than the case she is solving. She has her own reasons for living in Kiribati and leaving her Scottish homeland and you sympathise with her struggle for wanting to solve the case whilst being looked negatively as a woman trying to do a mans job. Food of Ghosts is an intriguing read. I can imagine that Wheelaghan could have easily gone down the route of depicting Kiribati as an island paradise – this most certainly would have been the easiest option. However, she handles the balance between tropical lifestyle and the struggle of daily life in the middle of the Pacific with careful respect, great detail and real knowledge of the setting. It is this feature that makes Food of Ghosts standout. Kiribati has not had a fictional novel that reaches out to such a broad audience and yet explains local life to such detail. 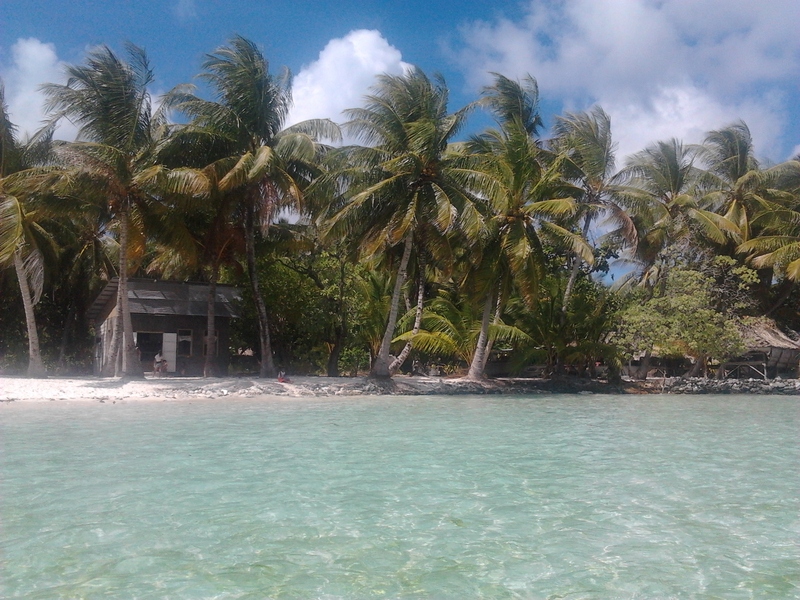 Fingers crossed that Wheeleghan writes more novels set on Kiribati – it would be such a shame to leave it at one! I have written before about the story of my mothers’ uncle being lost at sea for 39 days. When I wrote about it, the majority of responses I received were an unbelieving ‘that can’t be true. No one can survive out at sea for that long’. And were I not I-Kiribati, I would probably think the same. It sounds impossible! But knowing the Kiribati people, I have the strong opinion that if there were to be anyone to survive being out at sea for long periods of time, it would be the Kiribati man. 46 Days Adrift is the true story of Ben – a 22 year old man becoming lost at sea with his ageing diabetic uncle and his younger cousin. Reading the weather wrong before setting off from the outer island of Maiana to the main island of Tarawa, the two young men and their uncle – who is an experienced sailor and fisherman – run off course and suddenly a two hour boat ride turns into 46 days. Told through the eyes of Ben, Ben’s mother Toati and his adopted father Neville back in Armidale, Australia, it is an extraordinary tale told through three very different eyes: Ben is young, loves to party and is more than comfortable to risk his life through pub brawls and speeding on motorbikes; Toati, a worried mother and is doubting her faith in her religion; Neville, a hardworking, adopted father figure for Ben who is stuck in Australia trying to do everything in his power from so far away. Whilst Ben is battling with the ocean – trying to think of new ways to collect rainwater and using the dead skin from his feet as bait to catch fish – you would be forgiven for assuming his story will be more compelling than his mothers and Neville’s. However, Taoti and Neville’s story of the time 46 days is just as mesmerizing. Taoti struggles with guilt – thinking the whole event is her fault. She is begging to anyone on the island to help her – asking the Kiribati Government, the Marines, local fisherman, the church and even a local coconut leaf reader who amazingly predicts correctly the three men’s wellbeing on the boat ‘They are okay and are waiting to be rescued’. Her religious faith is tested which leads to her leaving her church to join another Christian church. It is her story in which we feel an overwhelming sense of urgency and panic. In comparison, Neville’s story is of frustration and helplessness. Whilst Neville funds many of the sea patrol searches and tries with every effort to gain assistance from the Australian government (Ben is an Australian citizen), he can only do so much from over the phone. He is left to rely on Taoti’s reports from the locals and – though not being religious at all – it is a truly wonderful moment when he decides to put all his faith in the predictions of Taoti’s new church leader and the old coconut leaf reader. Although he is miles away, you feel that Neville is the only person that Taoti can relate to in this time of need. With Taoti running around the island on her motorbike trying to get help from the locals and Neville on the phone in Australia, the two together honestly demonstrates the worry, guilt and helplessness of the whole situation. Ben in the meantime is floating throughout the Pacific watching illegal fishing boats refusing to rescue them for fear of being discovered of fishing illegally. Whilst times are testing, the most surprising thing is that they seem to do okay. Sure life is tough but Bens uncle (who has unluckily had the experience of being lost at sea before) is a leader or ‘unimane’, a respected elder man of the community. He is calm and a thinker whereas Ben’s younger cousin on the boat is panicked and angry. Their ability to catch fish (even a shark!) and keep their health and hopes alive is almost unbelievable. It is only when a wave overturns the boat and tips over their tiny bit of shelter, their dried fish and collection of fresh water as well as gain a hole in the tinnie does Ben really become desperate and doubting his own mortality. By this time, his uncle has given up hope and is incredibly sick due to his diabetes and with this, Ben’s hopes diminish rapidly. Looking back on it now, I think I began reading this book expecting perhaps an action genre, but on completion, I sat back and reveled in the thought that this was a book on faith – of course it was! When times are so desperate and when the back of your mind tells you that hope is lost – your only hope is to rely on faith. Whether that is religious or not, but the faith that they could still be alive and be found was the only option for Taoti and Neville. For Ben also. He reflects that help only came when they were at their absolute worst – no food, no water, no energy and sitting in a boat that was slowly filling with water. Whilst he doesn’t want to think too much about what kind of ‘lesson’ was to be learnt in this, us readers learn that when times are tough, it is only belief in something positive that will get you through; because if that is lost, then one may as well give up. The joy of being able to read two books about Kiribati was enough for me though I understand that a lot of readers have not been to Kiribati! Though ideally, I’d suggest for readers to read both, I understand that my interest in reading them is slightly higher. So for those with varied tastes here are the main themes and differences between the two novels for you to choose which to read (first!). Food of Ghosts is written with great description of the Kiribati, Louisa’s character and her constant questioning of the customs is incredibly insightful. The gossiping and superstitions is still a major influence on life on Kiribati and readers are delighted as well as surprised with the culture shock. 46 Days Adrift is a story of survival, faith and mortality. Even the most experienced explorers and travellers find the notion of surviving 46 Days out on the Pacific Ocean believable. This journey is told in such a real and matter a fact way that the broader theme of faith and the unwavering belief in local Kiribati mythology/witchcraft is tangible and testing to the biggest unbeliever. If you are reading this blog, then I can only assume that you are interested in Kiribati and the Pacific Islands! I recommend these two books as another avenue for you to learn more about the incredible people that live on the land and sea – I promise you won’t regret it and you’ll enjoy the journey. Previous Post Paradise on earth? Welcome to the Pacific! Really enjoyed your reviews. We so ‘get’ the notion of enjoying a new and different perspective, when you read about a place in fiction, or through the eyes of an author. A really stimulating way to get to know a place. Thank you! Are these books available online, the reviews were great & I’d like to read them!! I’m not entirely sure they come in other formats. I am an avid reader so I am definitely picking this up through my kindle! I’m also buying a hard copy to save on my shelves as a keepsake to pass down to family. I never thought to look for any books where its storytelling was based in Kiribati. Ko raba and much love to you for this post and for your amazing writing. I’m glad you enjoyed the reviews! Both books are a wonderful to read especially as an I-Kiribati person. It’s really amazing seeing the islands written so vividly. I hope you enjoy them! Thanks for following! I too gladly stumbled upon your site. I am trying to read more Pacific Island literature, I will let you know when I find some gems! I just realised that I forgot to say thank you for reading the blog and commenting! I’m going to try and hunt down more Pacific writers and review them. Here’s hoping there is quite a bit out there!